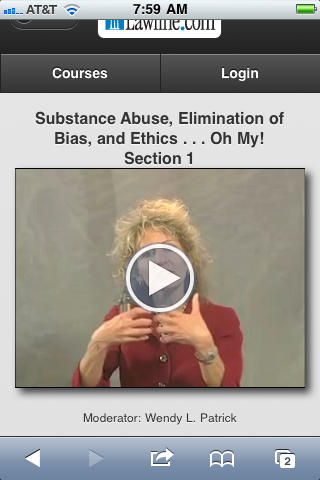 The online CLE provider Lawline.com has launched a mobile-enhanced website that allows all of its more than 300 video CLE programs to be viewed on most mobile phones and smartphones. While it is not the first to provide audio of CLE through a mobile phone, it is the first to make it easy to view video of courses. Open www.lawline.com in your mobile browser and you will be redirected to Lawline’s mobile-enhanced site (or just go directly to m.lawline.com). Once there, you are presented with a list of categories (ADR, antitrust, banking, bankruptcy, etc.). Select a category to see the list of courses offered within it. 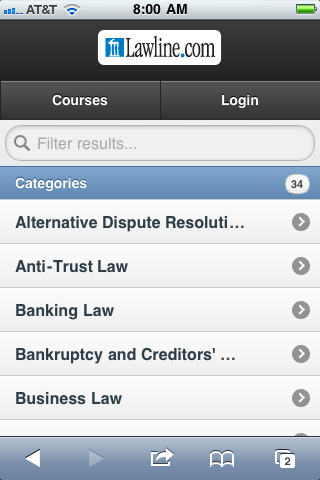 Or, you can toggle the view to see a list of all courses by title. Once you select a course, you come to a page from which you can launch the video. The page includes a description of the course and tells you the states in which it is eligible for CLE credit. From this page, you download a PDF of the course materials or an MP3 file with just the course audio. I like that the page includes reviews of the course from others who have taken it. Embedded at random points within the videos are verification codes that you will need if you want CLE credit. These provide proof that you watched the whole video. After you’ve completed the course, you are e-mailed a certificate of completion. So far, it costs nothing to view any of these videos on a mobile phone. I suspect that this free access is only temporary, given that Lawline describes this new mobile-enhanced version as a beta. Plus, unless you are a registered Lawline subscriber, you cannot obtain CLE credit for any of these mobile course or download any of the course materials. 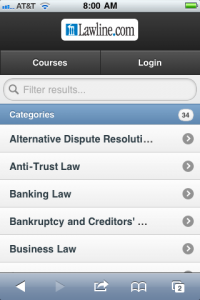 Prices for Lawline courses generally run around $40 a credit. It offers a variety of subscription bundles or a full year of unlimited CLE for $499. One minor complaint about the mobile version is that it does not show course prices — or at least I couldn’t find them. As I mentioned earlier, there are other ways to get audio of CLE on your mobile phone. For example, West LegalEdCenter and Practising Law Institute both have apps for the iPhone and iPad. There are a number of CLE podcasts available through bar associations and private providers. But Lawline appears to be the first to provide video. Having now watched bits and pieces of a few of these, I can report that the mobile site is easy to use and that the videos ran without a glitch.